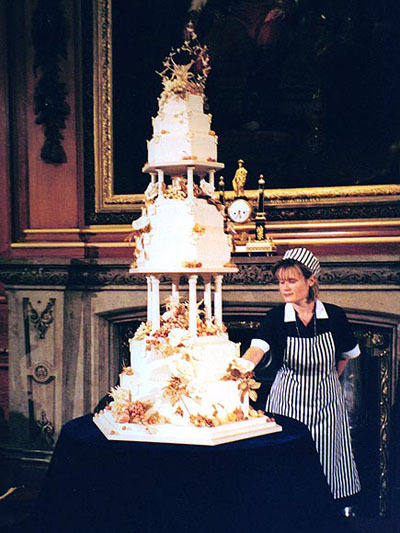 One important element present at all Royal Weddings is the wedding cake. It is generally a fruitcake served at the Royal Wedding breakfast. Royal Wedding Wednesdays Let Them Eat Cake. Prince William and Catherine selected Fiona Cairns as their wedding cake designer. The cake was a multi-tiered traditional fruit cake with cream and white icing. The decorations included several symbolic flowers to represent the four home nations including the English rose, Scottish thistle, Welsh daffodil, and Irish shamrock. In addition, the design also included the flower, Sweet William. No doubt a nod to the Prince. The couple also asked the McVitie’s Cake Company to create a chocolate biscuit groom’s cake for the reception at Buckingham Palace. 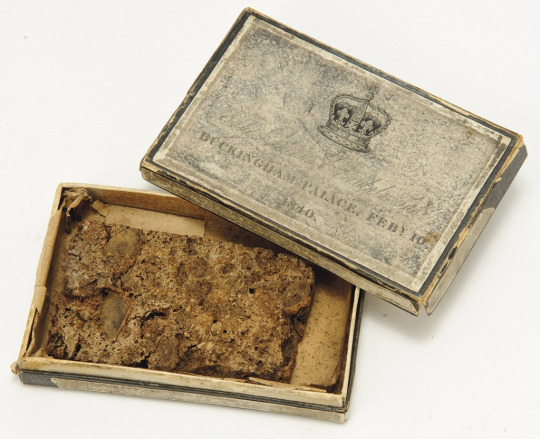 The chocolate biscuit cake was often made for Prince William when he was a child by Darren McGrady, who was the personal chef to Princess Diana. Both selections give a nod to Prince William’s parents as Lady Diana and Prince Charles also had a multi-tiered fruit cake at their wedding. It was created by David Avery who was the head baker at the Royal Naval cooking school. The cake was decorated with royal icing and featured the Windsor royal coat of arms, the prince’s coat of arms, an ornamental “C” and “D”, Lady Diana’s family crest and dozens of flowers. Mr. Avery said that the cake took 14 weeks to create. Several of the weeks were of course devoted to the design research and how the cake should be constructed. Fruitcake was selected as it could be prepared in advance and keep very well. Mr. Avery used a recipe of his mothers that was adapted for size. The bottom layer took 12 hours to bake. The finished cake weighed 255 pounds and stood over 5 ft. tall. The baker made two identical cakes, just in case one was damaged in transit. The original cake was delivered unscathed and the remaining cake was cut up and each trainee received two pieces, one for themselves and one for their mother. Mr. Avery never ate a final slice of cake, although he did say he sampled a few bits as he was making the cake. 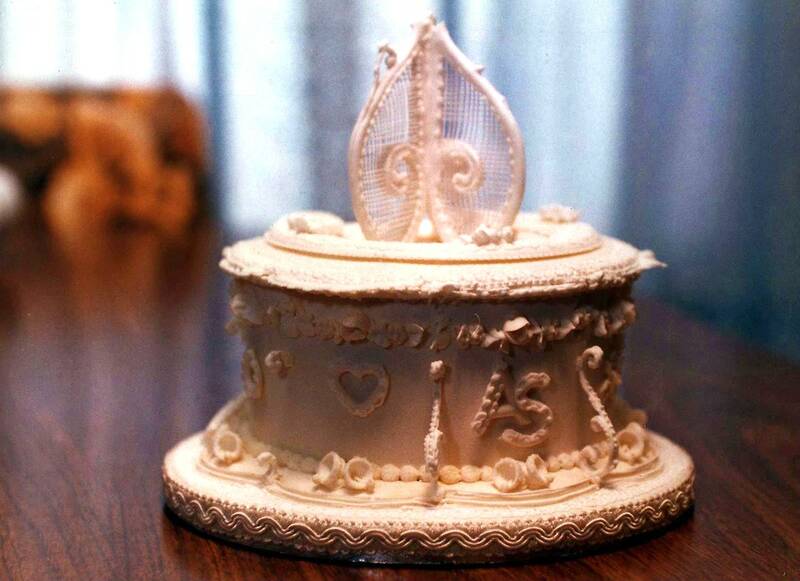 The second tier of the cake was saved and served at Prince William’s christening the following year. This is customary in England. In America, newlyweds often save their top tier to eat on their first anniversary. Various cake makers delivered their designs to Buckingham Palace I imagine in the hopes of possibly being selected for future royal events. This will probably hold true for the wedding of Prince William and Catherine as well. So what does the palace do with all the extra cake? It is nicely packaged up and a piece is given to each guest at the reception, in addition to the all those who assist with the production of the wedding, including Palace workers. 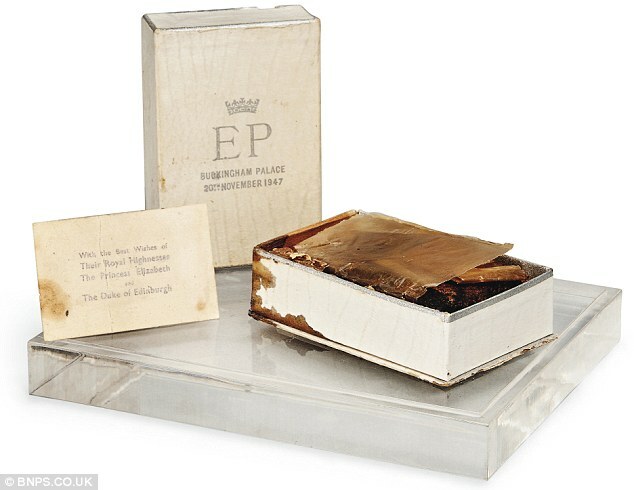 Here is how the cake was packaged for Prince Charles and Lady Diana’s wedding. Recently a former Royal servant, Moyra Smith, auctioned off a piece of cake she had received and it sold for $1830.00. 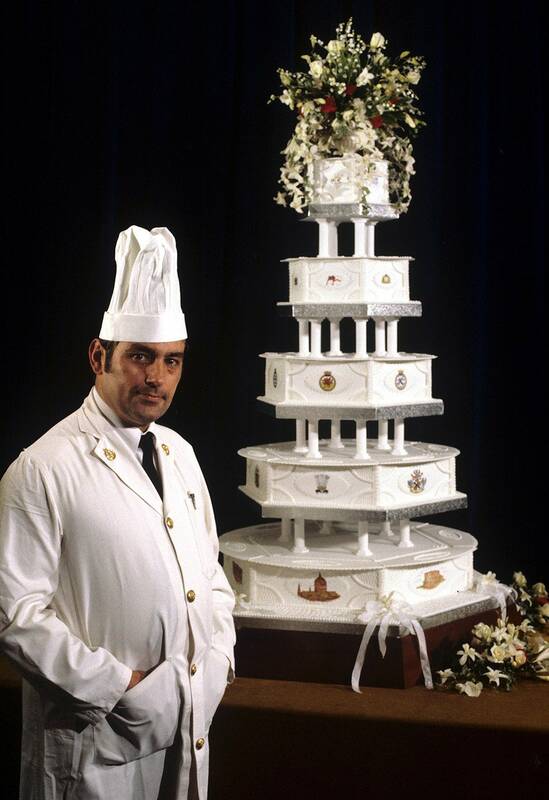 A few years later when Prince Charles’ brother, Prince Andrew married Sarah Ferguson their cake was created by David Cakes. The cake stood seven feet tall and was adorned with delicate pastel flowers. For some reason, they never used the top tier and it was auctioned off many years later. David Cakes also created the cake for the wedding of Prince Edward and Sophie Rhys~ Jones. The gothic styled multi-tiered cake used Royal icing in nontraditional colors. It featured over 500 handmade sugar flowers and was quite striking. When Princess Anne married Capt. Mark Phillips the couple chose a very traditional cake. But the cake that truly “takes the cake” is that of the confection served at the wedding of Queen Elizabeth and Prince Philip. Due to wartime rationing, the ingredients were given by Australian Girl Guides (Scouts). 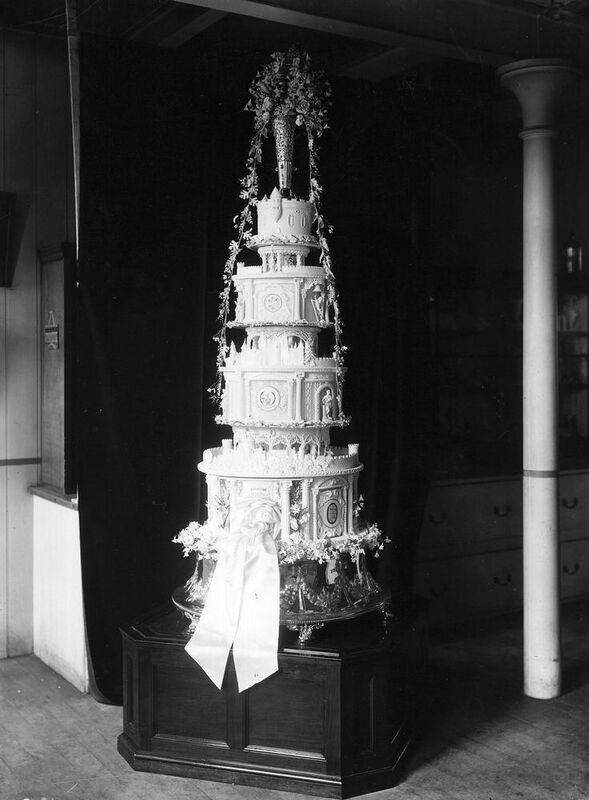 The cake featured four tiers and was over nine feet high. Decorated with Royal icing the design featured hundreds of filigree curves that were likened to turrets on the Royal family’s beloved Scottish castles. During the reception, the cake was cut using the Duke of Mountbatten’s sword. After the wedding, pieces of cake were given to schoolchildren and several institutions. The Queen’s sister, Princess Margaret, had a much smaller cake when she married Lord Snowdon. Still, the hexagon shaped cake weighed 150 pounds. The sides of each tier bore the Princess’s coat of arms as well as the couple’s new monogram. 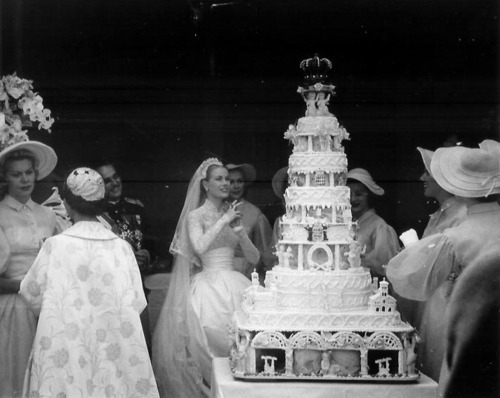 When Grace Kelly became Princess Grace of Monaco in 1956 she too had a towering cake. 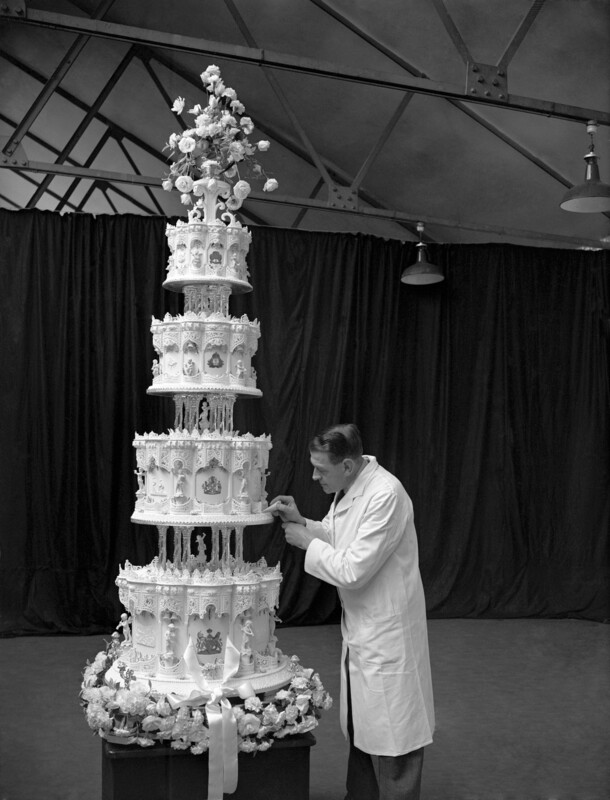 Prince William was not the first to request a cake made by McVitie. In 1934 when the Duke of Kent married Princess Marina of Greece their cake was made by Messrs, McVitie, and Price. Garlands of flowers were draped over the large cake layers. The tiers were supported on the cake with Grecian styled pillars in honor of the bride’s nationality. 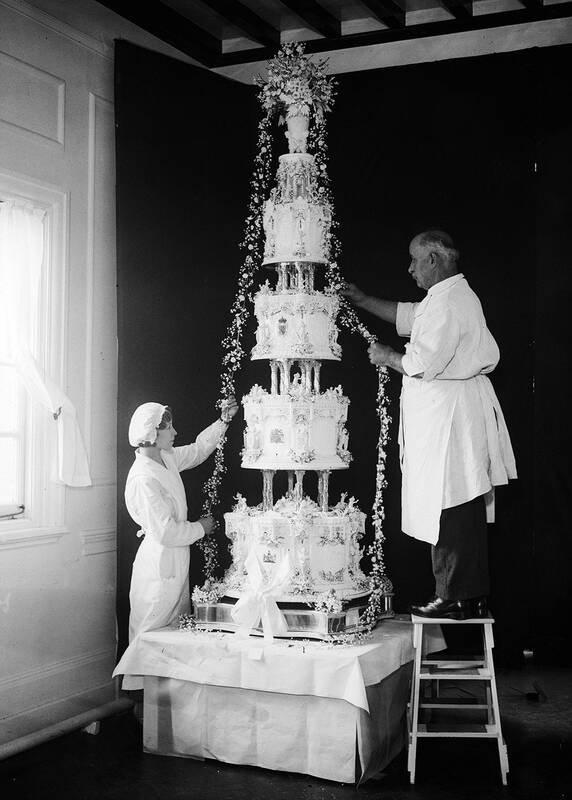 When Queen Elizabeth’s mother, Lady Elizabeth Bowes-Lyon, married Prince Albert, later King George VI of England, in 1923 their cake featured fresh floral garlands and large satin bows. 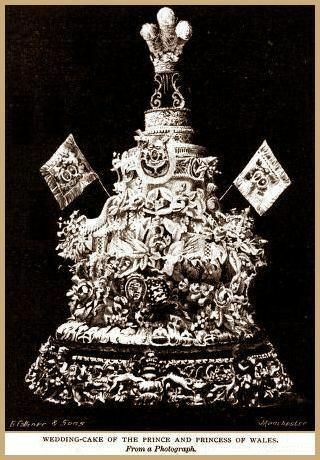 Here is King Edward VII’s cake. He married Princess Alexandra of Great Britain in 1863. The three-tiered cake had rose, thistle and shamrock festoons intertwined with the British and Denmark coat of arms. At the very top were three ostrich feathers, the symbol of the Prince of Wales. Princess Victoria (Queen Victoria’s eldest child) and Crown Prince Frederick William ‘Fritz’ of Prussia wed in 1858. Their cake had a very Neo-Classical look. 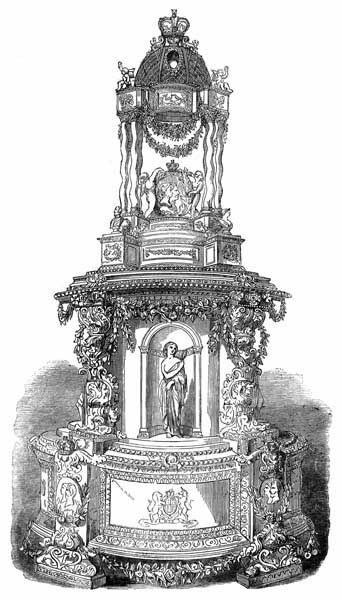 The wedding cake as we know it really came into vogue in the 1700’s. The multi-tiered cakes were made with fruit to symbolize fertility. It should be noted that at this time perishables were extremely expensive. Refined white sugar was one of the most expensive items of all. 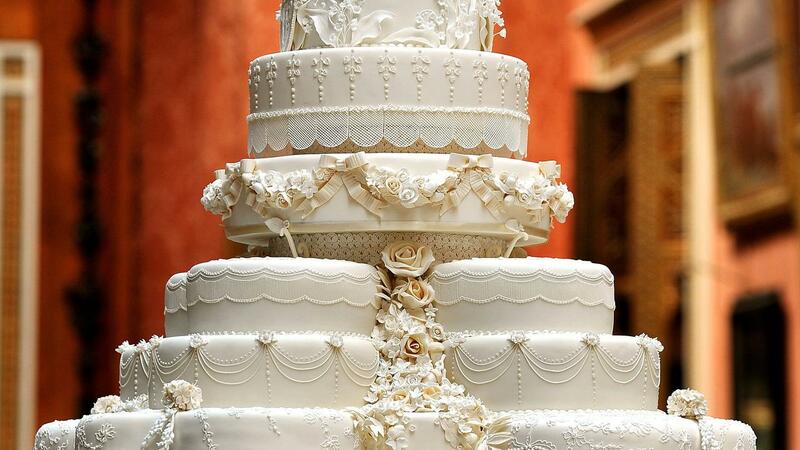 The traditional white wedding cake was not a symbol of purity and virginity but rather a sign of a family’s wealth. The thick icing now known as Royal icing gained its name when it was used on the wedding cake of Queen Victoria and Prince Albert. 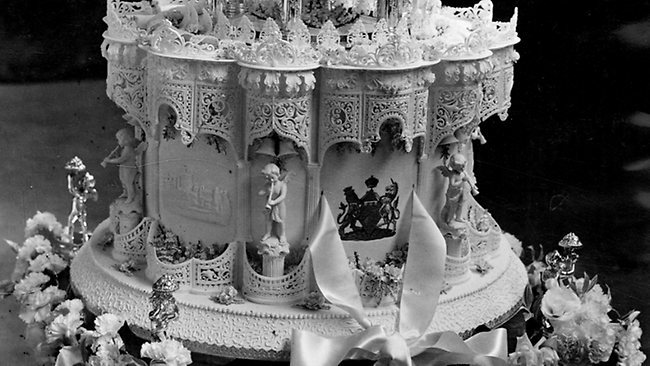 Mr. John Mauditt, Queen Victoria’s confectioner at Buckingham Palace, made the wedding cake. It measured over 9 feet in circumference and weighed more than 300 pounds. The figure of Britannia was placed on the top of the cake to symbolically bless the bride and groom. It also featured bouquets of white flowers tied with lovers knots made with white satin ribbon. These were later given as gifts to the guests at the wedding breakfast. What type of wedding cake did you have? Fun post, but now I'm hungry! I must say out of all of the, I love the cake of Prince Edward and Sophie Rhys~ Jones! Mmmm….cake! I love cake! When James Bond and I got maried, my mom made our cake (she did it as a profession). I adore strawberry cake, but my mom thought it would be to much for it all to be strawberry, so we alternated layers of stawberry and white cake. The bottom cake (strawberry) required a professional oven because the pan was too big for a standard oven. It was a huge cake and took weeks to bake (she always freezes her cakes before icing them as it helps keep them moist) and hours and hours to decorate. It was beautiful though. Indy always bakes me a strawberry cake for my birthday (he really enjoys baking) covered with dark chocolate icing. Best. Cake. Ever. I can't wait to see all the cakes for Will and Kate! And a McVities Cake? Sheer awesomeness. I LOVE McVities Dark Chocolate Digestives. YUMMY! BTW, Han Solo was born on Monday! Come over to my blog for sheer cuteness. Giving birth makes you hungry. I could go for some cake right now! I had a wedding coordinator business for many years and first started out just making cakes and those are some elaborate cakes! My oldest daughter is getting married in October and I'm hoping she doesn't pick out something that constructed! LOL! My personal favorite cake is a strawberry cake with chocolate swirl and iced with buttercream or I make a chocolate cake with chocolate ganache icing and filled with a homemade raspberry filling and sometimes would just ice with the ganache and swirl the filling on the plate underneathe the piece of cake. Those were two of the most popular cakes I did. This post is just wonderful! What a great way to start my Wednesday morning. So much interesting information as well. My favorite cake is “Red Velvet Cake” made with the delicious cooked icing. I think Queen Victoria's cake is my favorite, and I love the history behind royal icing. How interesting. For how frilly and detailed Princess Diana's attire was, their cake seems kind of, not plain, but maybe a bit lacking in femininity? But who am I to talk? Husband and I had cupcakes for our wedding, and we were thrilled with them! My mom is a professional wedding cake baker/decorator so I have been around weddings and wedding cakes all my life. I don't think she has ever made any cakes quite that tall! Very impressive and I am sure delicious! Oh Let them Have and Eat the Cake too, indeed. I will have to choose HM Queen Elizabeth II and Prince Philip Wedding Cake. First for the significance of having the Scouts collect the ingredients and offering them – how mush sweeter could they be. The detailed pic you posted is amazing. My least favorite is, surprisingly as I love the couple, Prince Edward and Sophie's cake. I guess gothic is not for me, but I feel sick only by looking to it. Great post. Now I am wishing I wasn't diabetic and I could sneak a piece of cake (even a Little Debbie). When hubby and I got home from our honeymoon the cupboards were bare and we were hungry. We found our wedding topper cake in the fridge and we ate it. Sad but true. I have a pastry chef in the family currently attending the Culinary Arts Institute in NY. It's amazing how much time and effort go into these cakes. They are almost too beautiful to eat. My favorite choice of cake is tiramisu. Just crawled out from under my rock and have much reading to catch up on. For our wedding, we had a three-tiered fruitcake, baked by my mother and decorated by my aunt. Sweetpea icing flowers trailed all over it. In addition to the bride's cake (the decorated one) we had groom's cake – more fruitcake that was cut into logs about 2.5 inches by 1 inch. These were individually wrapped in pink foil, then rolled in a paper doily and tied with a pink ribbon. Each guest received one to take home. It was very traditional for weddings back in the late 1970s in Canada. However, I hate fruitcake and never ate one bite. I ate the icing instead. Yet another wonderful Wednesday to adore. I really liked most of the more modern cakes except Edward and Sophie's cake. But then, their wedding taste isn't really mine. I didn't like her dress, either. My FAVORITE was Queen Elizabeth's cake. I love that. I think Anne's was really lovely too. I think I might try that chocolate biscuit cake. It sounds good. In my area, fruit cakes aren't traditional for weddings. It makes sense since those buggers keep for about 2 decades. Laura, this is just a fabulous post. I loved every picture and every word. Just fascinating! I think I like Queen Victoria's cake best or possibly Her Majesty's cake. In terms of my favorite cakes, anything chocolate and rich. I also like Hummingbird Cake (rich and sinful). My grandmother's specialty was Coconut Cake, and my aunt's specialty was Caramel Cake. My mother's specialty was going to the bakery and buying us a wonderful white cake with white buttercream frosting complete with pink roses for our birthdays. That was my standard order as a child. Now, my cake of choice is Publix Chocolate Ganache Bon Bon Cake. It's out of this world and is available at any Publix supermarket in Florida or in any of the other states where Publix is now located (Ga and SC, to name two). Thanks for all of the hard work you put into these Wednesday posts. mmmm … what IS royal icing .. I want some. I feel a whole lot smarter now! Wonderful post as usual! Thanks so much! I posted a recipe for the McVitie's biscuit cake & a video about making it on my other blog last week antiquesandteacups.blogspot.com. I love the photos you find. Thanks again! Once again, a fascinating peek into a lifestyle none of us will ever live! My favorite cake of all is much simpler than all of those…the chocolate cake recipe on the back of the Hershey's Cocoa box! It's delicious, very moist and just wonderful! The frosting recipe that comes with it is also my favorite! Great post, I'm getting hungry. It has to be one of the best light cakes ever. I love English cakes, though. So dense and rich with fruit. When we lived in England I enjoyed them and now continue to bake them for special occasions. This is a fascinating post, Laura, as are all the posts you are doing for the royal wedding. These cakes are all gorgeous…I am a little surprised that Charles and Diana's cake was plain in comparison to the rest, or maybe that is just me. All of the cakes are lovely, but really I prefer simple, non-complex varieties. Of all of the photos, the first two at the top are my favorite. So interesting to see and read about the royal wedding cakes! I'm excited to see how William and Kate's turns out. Our wedding cake was a white cake with almond flavoring and almond icing and it was gorgeous, too, with cream/champagne-colored swirls and piping and fresh flowers – a friend does wonderful cakes and I was lucky enough to have her make ours. Wish I had some right now! I guess if one happens to be a royal you can only have a 300 lb cake that must be cut with a sword, but this all still seems very over the top. I guess that's the point, right?! Very fun post, Laura! Cakes are serious biz in my family, and no birthday party is complete without like three cakes. Thank you for all of this research, I like the cakes almost as I like wedding dresses. Wow, that chocolate biscuit cake sounds great! I like Sarah Ferguson's cake too! You've done it again – great post! I can't wait til this wedding! I personally LOVE to bake cakes and make several different kinds from traditional to a variety of french, almost flourless but my favorite is a chocolate layer cake from Country Living my mom made for us as children – I have changed it to dark chocolate and it is now my signature for birthdays! It melts in your mouth! Oh, to bake like that! What a fun and gorgeous post. Each one was a confectionary delight. I too am salivating now! How wonderful. I love all kinds of cake, even wedding cakes! Interesting post about these eloquent cakes! My favorite cake is the one that went so long and is in my stomach…yummmm. What a fabulous and fascinating post! Wow! You must spend days putting these posts together. Thank you! They are so beautiful. I'm going to be kind of sad once Kate and William are married. I hate to admit this but my favorite wedding cake was actually from my first wedding. 🙁 The company is still in business in Scottsdale… LOL! It was a delicious mocha cream! I enjoyed this post, Laura! Steeped in history and so over-the-top. A wedding cake that you need a ladder to decorate! Love it! Let them eat cake! I can’t say I’m big on the tier “legs” or posts being visible. I know they’re needed but those cakes make me nervous. Some of them look a little tacky to me, although the decoration on all were really quite spectacular. I really love William and Kate’s — simple and elegant. Andrew/Sarah’s reminded me of her wedding bouquet with the cascading flowers. They sure know how to package things well. I love that idea! As you know, Rick and I skipped the wedding part but if we were to have a wedding cake it would either be lemon or carrot since I don’t like chocolate cake and he doesn’t like white cake! His mother would like to make it and we’d say “Oh, please don’t” although her decorations might be nice! I’m almost inclined to think I would serve cupcakes or pie. The best wedding we ever went to had a selection of pies and people talked more about that for years after than they did the bride or any part of the reception. If it’s good pie. Honestly, I don’t remember my wedding cakes – 2 marriages – 2 cakes. The first time around, it was a traditional tiered version but I can’t remember what type of cake or anything, other than the fact that I used my Mom & Dad’s cake topper/figurine from their 1962 wedding. The second time around was a casual backyard wedding and maybe that was the ticket because that’s the only marriage/relationship that’s lasted for me – 16 years this year! 🙂 I know that cake was a simple sheet cake with a round topper that I think I ordered through our local Meijer or something like that. They did a nice job, but nothing fancy like those of royalty. The day of our wedding, everything happened so quickly that when it came time for the cake, we didn’t even have an official cutting or any photos. I personally am not a fan of most cakes. Our wedding cake was a gold dough with white buttercream frosting. Very moist and delish indeed! It was decorated with our wedding pastels of peach, yellow flowers and pastel green leaves. The cake topper was bought at the bakery and had a pair of yellow satin-covered wedding bells with a little plastic bride and groom on it. I popped off the married couple and kept them—they’re precious. Our wedding cake was carrot cake with butter cream frosting. Hi Laura, It was fun reading about the traditions of the royal family’s wedding cakes. These cakes are so beautiful I don’t think I could choose a favorite. Since I work with royal icing for my decorated cookies, I found it interesting that the name came from Queen Victoria’s wedding cake. Our wedding cake was white cake with raspberry mousse filling. We froze the leftover cake and enjoyed it when we returned from our honeymoon. My mother-in-law saved the top tier of her daughter’s wedding cake until their 25th wedding anniversary. I cannot believe she re-arranged her freezer all those years around that cake. Needless to say, it was like a block of concrete after 25 years and inedible! I really enjoyed this post. I love the little flowers on Prince Williams and Catherine’s cake. The daffodils and lily do the valley are so pretty. 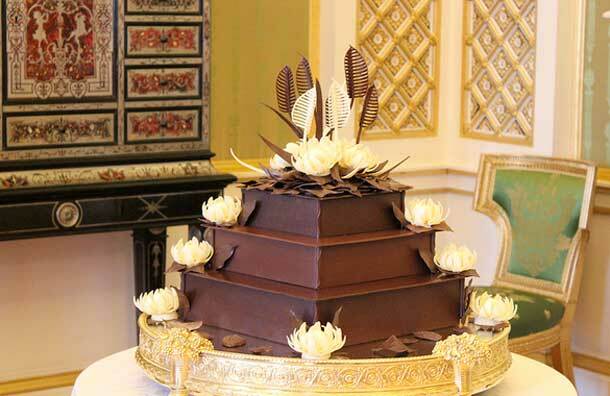 The Queen and Prince Philips cake looks so grand and intricate. Prince Edwards cake is an interesting color choice and not what I would have suspected! For my wedding we had a single tier Fraisier 9” cake that we cut for the picture and then little single serving Fraisiers for our guests. Wow, this is so interesting! I enjoyed this post very much. Your research is amazing. I love learning things about the royals. This is a fabulous series. Wouldn’t it be nice to have a beautiful tin as a keepsake from the wedding cake of a royal? This post requires several reads to fully take it all in. Thanks, Laura. I really look forward to your Royal Wedding Wednesdays every week and just love the wedding cakes! Have a great first week of spring and thanks so much for sharing your awesome post with FULL PLATE THURSDAY!